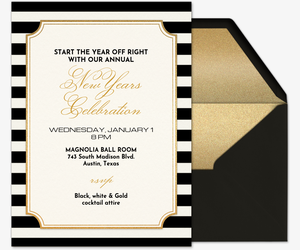 Ring in the new year the right way with a New Year’s Eve party. 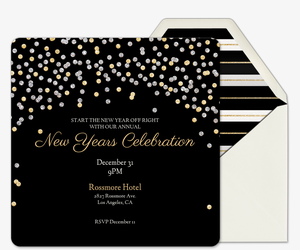 Set the stage for the midnight countdown with free and Premium digital invitations from Evite. 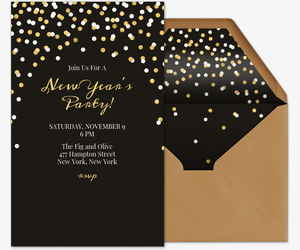 Whether you’re hosting a cocktail party, planning a family-friendly event, or hitting the clubs with friends, plan your night from start to finish with our beautiful, affordable, and easy-to-use invitations. 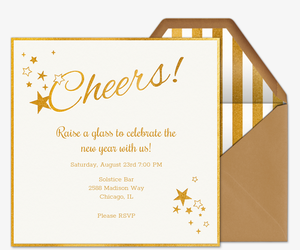 With Evite, it’s easy to make your online invitation your own. Add “What to Bring” lists (especially if your party is BYOB) and custom polls for guests. Encourage guests to get social by posting comments and photos on your private invitation page, so nobody misses a moment. Going paperless helps you stay organized. Track RSVPs, manage your guest list, send messages, and more. Plus, keep your plans in your pocket at all times with the Evite mobile app. 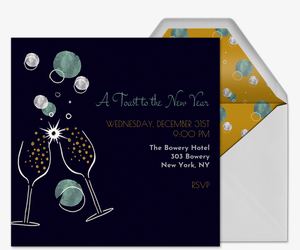 It’s the last night of the year -- make it stand out from the rest with Evite Premium. 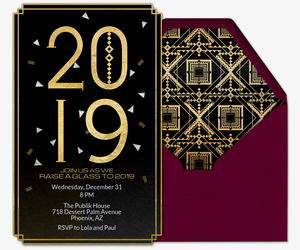 Premium invitations are an advertisement-free experience and come with matching envelopes and digital stamps, the option to add photo inserts and text cards, and other embellishments. Pricing is based on the size of your guest list. End your year in style with creative party ideas from ideas.evite.com. 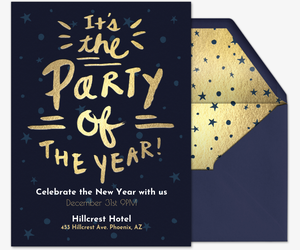 Make it the party of the year with our New Year’s Eve theme ideas, free printables, open house party guide, kid-friendly party guide, and more. Or, get general tips on holiday hosting. Dance, drink, and make merry all holiday season with Evite. We have invitations for holiday parties, Christmas parties, Hanukkah parties, office parties, and all other winter events. Toasting to another occassion? Celebrate birthdays, baby showers, weddings, and other milestones with Evite as well.